» Join Us TONIGHT For A Live Party ONLINE! Join Us TONIGHT For A Live Party ONLINE! FREE Gifts From Little Learning Lovies Just For Joining Us TONIGHT On Facebook! Do you have some ladies on your Christmas list that you would like to bless with something beautiful? Have a small budget to do it? Would you believe me if I told you that you can get them something gorgeous that you’re excited to give, and they’ll be excited to receive, for just $5? 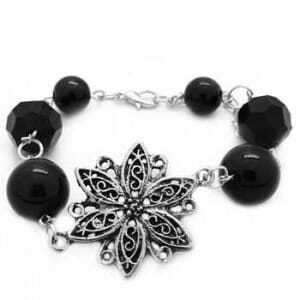 This pretty bracelet (which reminds me of both a flower and a snowflake!) is just $5. In fact, EVERYTHING that we’ll be shown tonight at our online Facebook party will be just $5! A FREE gift from Little Learning Lovies Just For Showing Up! I want to give you a free gift for joining us tonight. Please click over to RSVP (just click “Going”) and then remember to join us tonight at 9:00 Eastern live on Facebook. Everyone who does come will get a free special gift from me (it’s new and cute and fun for everyone). I will send you a coupon that will be good on downloads from the LLL store. The coupon amount will be half the amount you spent at the party (not including shipping). Jessica, our host (and my sister!) will let me know who made a purchase and how much was spent. I will then, within 48 hours, send you a coupon for half that amount that you can use at LLL! Cool, huh? So not only will you be able to cross off a few amazing gifts from your list, you’ll get something cool for your family, too! This is a SET! You get the Necklace & earrings BOTH for just $5! If you buy 7 pieces tonight, Jessica will GIVE you an extra one for FREE! Won’t you join us? Even if you aren’t planning to buy anything, I hope you’ll come check out the pretty jewelry AND grab your special freebie from Little Learning Lovies. I can’t wait to chat with you and share all the fun. HINT: If you’re forgetful like I am, you can do what I do… set an alarm on your phone to remind you about party time!